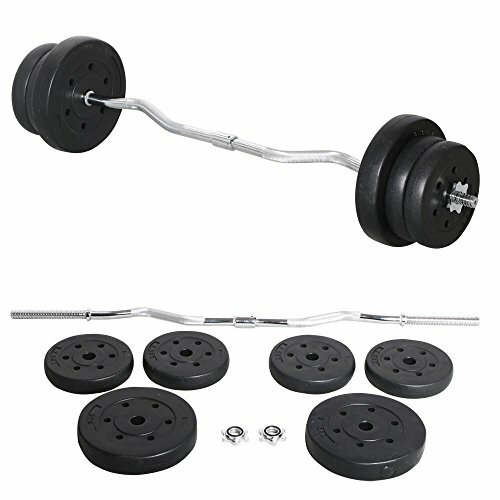 ┼Start serious workouts with high quality 25Kg Olympic Barbell Dumbbell. It is designed to strengthen your leg, hip and back power. It is an ideal addition to any home and gym. Curl handle bar is with chrome finish. ┼W-shaped handle prevent our hands from skidding effectively. There are 4 x 2.5 Kg (5.5 lb) and 2 x 5 Kg (11lb) plates. ┼You can adjust the barbell weight from 5Kg (11 lb) to 20Kg (44 lb) to improve your fitness level. You can arrange your workout sessions for it fit any season. Material:Threaded Handle: Iron;Plates: Rubber (includes concrete). Start serious workouts with high quality 55 lb Olympic Barbell Dumbbell. W-shaped handle bar prevent our hands from skidding effectively.